LinkedIn is the world's largest professional network. It lets you build your professional identity online, discover professional opportunities, connect with colleagues and classmates, get career-related news, and more. Your profile headline gives people a short, memorable way to understand who you are in a professional context. Think of the headline as the slogan for your professional brand, such as “Student, National University” or “Recent honors grad seeking marketing position.” For ideas and inspiration, check out the profiles of students and recent alums you admire. LinkedIn is not Facebook. If you choose to post a photograph — and we recommend that you do — select a professional, high-quality headshot of you alone. That means no party photos, cartoon avatars, or cute pics of your puppy. Include information about all institutions you’ve attended. Include your major and minor if you have one, as well as highlights of your activities. It’s also appropriate to include study abroad programs and summer institutes. Don’t be shy — your linked in profile is an appropriate place to show off your strong GPA and any honors or awards you’ve won. Your summary statement should resemble the first few paragraphs of your best-written cover letter — concise and confident about your goals and qualifications. Include relevant internships, volunteer work, and extra-curriculars. Present your summary statement in short blocks of text or bullet points for easy reading. “Specialties” is the place to include key words and phrases that a recruiter or hiring manager might type into a search engine to find a person like you. The best place to find relevant keywords is in the job listings that appeal to you and the profiles of people who currently hold the kinds of positions you want. A great way to stay on other people’s radar screens and enhance your professional image is to update your status at least once a week. Tell people about events you’re attending, major projects you’ve completed, professional books you’re reading, or any other news that you would tell someone at a professional networking reception or on a quick catch-up phone call. Joining Groups and displaying the group badges on your profile are perfect ways to fill out the professionalism of your profile and show your desire to connect to people with whom you have something in common. 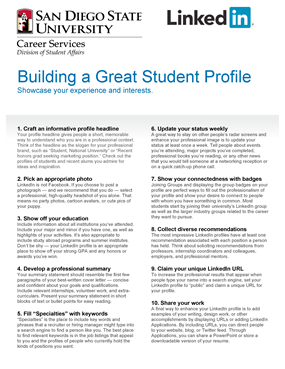 Most students start by joining their university’s LinkedIn group as well as the larger industry groups related to the career they want to pursue. The most impressive LinkedIn profiles have at least one recommendation associated with each position a person has held. Think about soliciting recommendations from professors, internship coordinators and colleagues, employers, and professional mentors. To increase the professional results that appear when people type your name into a search engine, set your LinkedIn profile to "public" and claim a unique URL for your profile. A final way to enhance your LinkedIn profile is to add examples of your writing, design work, or other accomplishments by displaying URLs or adding LinkedIn Applications. By including URLs, you can direct people to your website, blog, or Twitter feed. Through Applications, you can share a PowerPoint or store a downloadable version of your resumé.